My name is Tim Filewod I am in my 30's and currently live in the middle east in Qatar the country which will host the 2022 World Cup finals. For the past 6 years I have been writing a children's science fiction novel about time travel. It has taken such a long time as I am a family man with young chidlren and obviously have a full time job. It was my job that prompted me to start writing. I am a primary school teacher and have been for over 10 years and felt there wasn't a fun and exciting book for children who were about 8 to 13, about time travel. The book began a few paragraphs each night and has now grown into a novel of about 200 pages. It was published 2nd April 2013 and is available as an ebook or printed version. Please keep a watch on this website to find out the details of the sequel Time 4 All. It may be ready for publication in 2016. I will be writing it most nights. What are you like? Would you take a risk? When Toby is invited to travel through time one day, he accepts without thinking. He wants to find his father. Suddenly, he finds himself in the future – in a world with no countries that is controlled by huge multinational companies and policed by the Council and their Time Masters, who need his help. Toby persuades two of his best friends to join him and together they try to prevent an environmental disaster happening by travelling back in time to 1981. However, a sinister organization called MORSC wants to stop them. Will Toby be able to complete his mission and meet his father? And if he ever finds his dad, what will he be like? Follow Toby, Archie and Noor on a rollercoaster story of good versus evil, which will take readers back to 1940’s London during the Blitz and forward into the future. The future is filled with animals that can understand and work with humans, powerful walking and flying Mechtechs, hover cars, sky cycles, VDUTs and of course 4D squash. Can the children escape the MORSC disruptor agents, complete their mission and still get back to present-day Earth, all without suffering from the time bends? 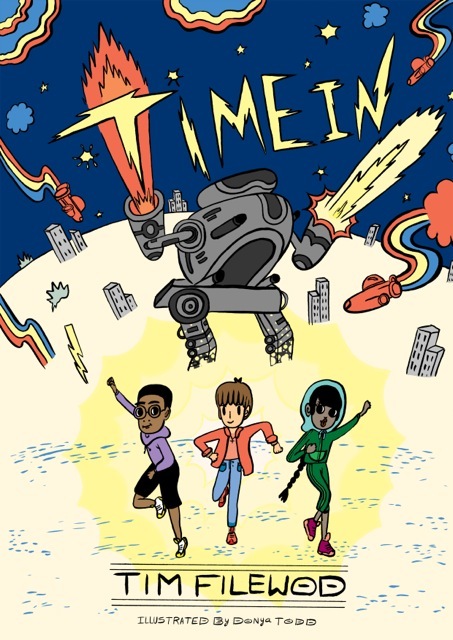 Time In is a gripping work of sci-fi fantasy that will appeal to children aged 9-12. The book, which is comparable to Alex Scarrow’s Time Riders, has been inspired by Philip Reeve’s Mortal Engines.